I’ve always ridden a hybrid but recently my husband and I have been thinking about upgrading to road bikes. The type of riding we’ve been doing most recently (longer and faster) certainly lends itself to better and lighter bicycles. So we did it! 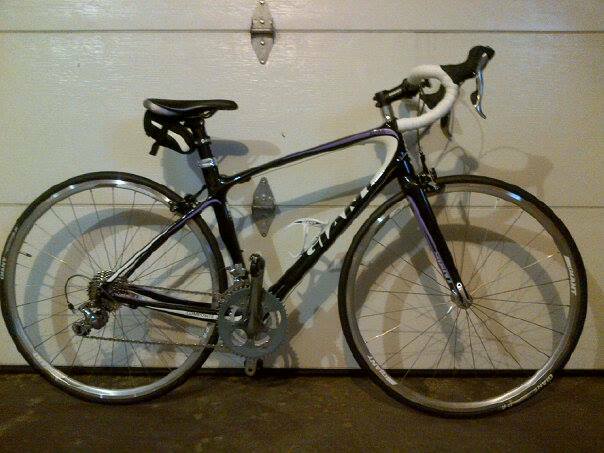 On Friday we hit the bike sale a Bike Works and splurged on two carbon composite road bikes. Mine is the Giant “Avail” Composite 3 and his the Giant “Defy” Composite 3. We took them out for their inaugural ride to the Kingston Market and we shaved approx 15 minutes off our normal time. They fly!